Kaitlin Kovacs is a researcher for U.S. Geological Survey – Southeast Ecological Science Center. 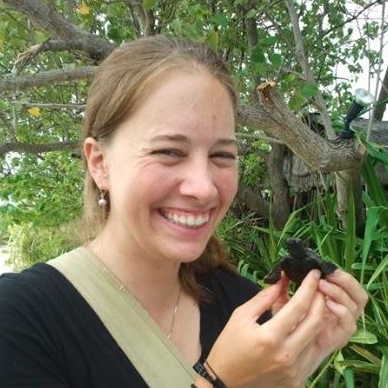 While she currently works in a deep-sea benthic ecology lab, her previous science adventures have led her to study artificial reefs in Florida, coral reef restoration in the Maldives, and coastal ecosystems in the U.S. Virgin islands. With her marine science background, Kaitlin is keen on using outreach and education to help engage local communities in marine conservation efforts. The ideas expressed below do not represent U.S. Geological Survey. The humor here is that scientific missions are rarely so openly coupled with emotion. And yet, the quirky marine biologist does not bother to hide that he is consumed with emotion after his partner is eaten by a shark. His anger and sadness fuel his scientific objective. Things have changed a lot since the days of Jacques Cousteau, when documentaries about marine science were inherently novel; these days, researchers regularly include videographers, photographers, outreach specialists, and journalists on their berth plans. Nonetheless, a new film backed by the crowdfunding website Kickstarter, with a Sundance alumnus at the helm, offers a new spin to the classic theme of marine biologists taking to the open seas. In other words, it’s the stuff The Life Aquatic is made of. To thicken the plot, the team of scientists at the core of this film are headed out to the dark abyss in search of the impacts of an ominous-sounding, but poorly understood phenomenon: ocean acidification in the deep sea. Cue the dramatic music. Acid Horizon, a film that is more than two years in the making, aims to emotionally connect audiences with the deep sea. The film follows Dr. Erik Cordes, a professor and deep-sea scientist from Temple University, in his quest to discover and understand the impacts of ocean acidification on deep-sea coral, specifically Lophelia pertusa. Ocean acidification occurs as the ocean absorbs carbon dioxide which then leads to a series of chemical reactions that ultimately decrease the pH level of the water. This creates inhospitable conditions that prevent marine species, like coral, from surviving. Although acidification is well-established as an issue for shallow-water ecosystems, the impact of increased acidity on deep-sea ecosystems is not well understood. What is known is that the saturation horizon – the depth below which carbonate will dissolve rather than precipitate – lies in the deep sea. His research pursues a specific hypothesis about acidification: that some deep-sea coral species may be genetically adapted to yield an evolutionary response to decreasing pH levels, making them “Supercorals” in the face of changing ocean conditions. Not only does Cordes aim to confirm his hypothesis that the deep-sea coral communities in the Gulf of Mexico are being impacted by ocean acidification, perhaps even more drastically than shallow-water reefs, but he also hopes to collect coral samples to help determine if they have developed unique adaptations to protect them from acidification. The implications of discovering such genetic adaptions are huge: not only would these “Supercorals” be the source of resistant strains of coral for building deep-sea reefs, but they may also unlock the secret for how shallow-water corals might be able to survive in the future. Deep-sea coral reefs are easily damaged by disturbance events, such as bottom trawling and pollution, and could be restored with these “Supercorals.” Even more so, it would yield an incentive for further deep-sea conservation efforts. Cordes’ calling, so to speak, has been to bring attention to the deep sea and the impacts that threaten its conservation. Over the years, he has contemplated the question of how the scientific community can cultivate an emotional response to something that is innately intimidating as it is dark, cold, and deep. How can the public connect to the deep sea in such a way that leaves them with a lasting impression of how absolutely amazing this ecosystem truly is? To achieve this, Cordes turned to a field more rooted in obtaining an emotional response: art. The intersection of art and science cannot be undervalued, particularly when the deep sea is involved. Beyond addressing Cordes’ scientific mission, the film Acid Horizon does something that is not typically seen in the research community: it humanizes the science. The film features Cordes in his personal life, balancing relationships with his family, friends, and colleagues. And unlike most other ocean-based documentaries, the intent is not to just show the pretty stuff; instead, viewers will gain incredible insight into the challenges and frustrations that arise in science research and in the personal journey of a man fulfilling his passion. While the research is funded by a National Science Foundation (NSF) grant, the film crew, including the Sundance affiliated director Ivan Hurzeler and producer Kurt Langer, turned to Kickstarter to raise the funds necessary to film three weeks at sea. The fact that Cordes, Hurzeler, and Langer have been friends since childhood – and are personally invested in the lives of each other – bolsters the emotional aspect of their documentary. And it is the emotional response that the producers of Acid Horizon hope to garner from viewers. If they are successful in that venture, then they will bring attention to the issues of ocean acidification in the deep sea. The research cruise, sailing under the same name as the film – Acid Horizon – will depart late April 2014 aboard the RV Atlantis. The film and science crew will spend three weeks at sea in the Gulf of Mexico, and will be using the recently upgraded Alvin, as well as the autonomous underwater vehicle (or AUV), Sentry, to conduct research and collect video footage for the film. The research team represents an interdisciplinary approach to understanding the broader ecosystem. Deep-sea biologists and ecologists, geochemists, biogeographers, deep-water navigation and acoustic specialists, and geospatial professionals will contribute their expertise to present the “bigger picture” of this research mission. The team will consist of scientists and graduate students from Temple University, Woods Hole Oceanographic Institution, U.S. Geological Survey, Haverford College, University of California at Santa Barbara, Pennsylvania State University, and the University of North Carolina at Chapel Hill. Even sans blue jumpsuits and red beanies, this film is sure to offer up its own fair share of drama, quirkiness, and relatable cast of characters. The film’s director hopes to launch the film into film festivals in the next year or so, but in the meantime, research and film updates are available on the film’s website at www.acidhorizon.com.